I wanted to thank everyone that voted for an artist's can design for The Inked Up World Tour Contest, which was put on by RockStar, Sullen and Inked Mag. They had it last year as well with different artists. This year 12 different tattoo artists designed a Rockstar can early 2014 just for this contest and promotional purposes only. Each artist had a tattoo convention stop where they were the featured artist for this tour they were a part of. It was a good time! My stop was in Calgary Canada and it was the last stop of the tour. The grand prize for this contest was $20k! When I decided to participate in the Inked Up World Tour, I had a clear vision of what I wanted to try and accomplish. 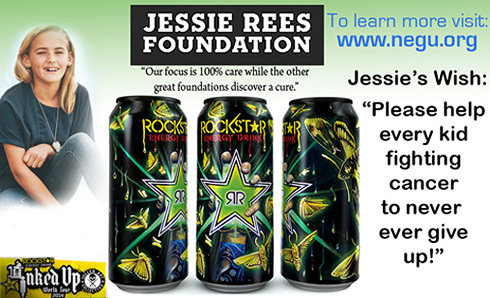 My plan was to design a Rockstar can and if I were to win I would donate 100% of the $20,000.00 Grand Prize to charity! My biggest struggle was figuring out which one to donate to? There are so many great causes that need financial assistance. After performing a lot of research into different charities, I got wind about this great foundation from Skip Schumaker and it truly touched my heart. If I would of won, the plan was to donate the ENTIRE $20,000.00 to the Jessie Rees Foundation! Win or lose, I'd also be giving away a free tattoo to one lucky person I'll randomly select from a list of voter e-mails when I get them. If the winner of the tattoo decides against the tattoo due to any reasons, I'll personally donate more money towards the cause! Unfortunately, I didn't win the Grand Prize, but on a positive note I got third place which was still in the green! Third place was $1500 bucks, we wrote a tax free check to the foundation. I wish I could have done more but it's all over and again thank you to everyone that voted for me!